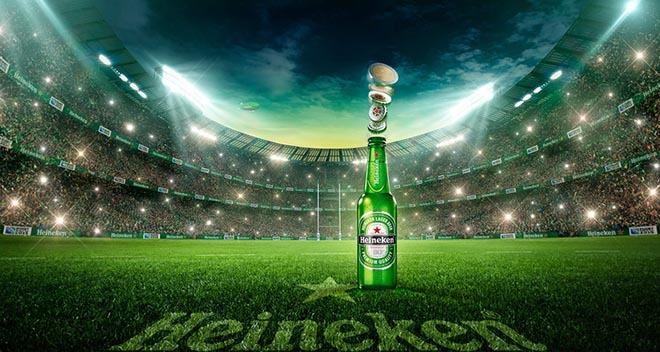 Heineken, one of the sponsors of the 2015 Rugby World Cup, is running “It’s your call”, a global campaign giving rugby fans the opportunity to take part in the start of every game in the tournament. Fans will be responsible for the coin toss that will determine which nation kicks off the game. Everyone across the world will have the chance to enter a competition to flip the coin at their country’s game and one very lucky fan will flip the coin at the Rugby World Cup final on October 31st 2015. The It’s Your Call campaign began with “Heineken The Coin”, a global commercial, screened first during the Ireland Vs. Scotland match. A fan travels through London at breakneck speed to deliver the official coin to the referee in time for the Rugby World Cup Final. But there’s no direct route of course. The coin bearer cheekily, yet charmingly wangles some priceless moments with rugby officials along the way, not to mention bumping into all-time Rugby legend, John Smit and former All Blacks player Jonah Lomu. Thousands of coins are being minted to give rugby fans in each participating country the chance of flipping the coin at their nations game. The Heineken The Coin campaign was developed at Rothco, Dublin, by executive creative director Alan Kelly, art director Stephen Rogers, account manager Susan Nelis and account director Grace Looney, producer Margaret Levingstone, and strategist Shane Doyle at MCCP. Photography by Kevin Griffin was retouched at Taylor James. Finished artist was Gerry Cole. Filming was shot by director Reynald Gresset via Partizan with director of photography Arnaud Potier and producer Louis Saint-Calbre. Editor was Russell Icke at Whitehouse Post. Post production was done at Screenscene and MPC. Sound was designed by Locky Butler. Music, “Boomerang”, composed by Kristin Boge and Oliver Dommaschk, is performed by Miss Cass.